Assessed aspects of sustainability: environmental. Main purpose of Ecodesign is to incorporate environmental considerations into the design process of products and reduce products’ environmental burdens throughout the whole life cycle. The main purpose of the SWOT analysis is to assess the requirements for the application of the New LCA, as analytical tool characterised by a broadened and deepened scope if compared to ISOLCA, in the Ecodesign procedural framework. Ecodesign, also referred to as Design for Environment (DfE), Green Design, Environmental conscious/friendly Design, Life Cycle Design, is a systematic way of incorporating environmental attributes into the design of a product. It can be defined as “design which addresses all environmental impacts of a product throughout the complete life cycle of the product, without unduly compromising other criteria like function, quality, cost and appearance” . An ecodesign procedure starts considering the potential environmental impacts of a product throughout its life-cycle and leads to improvement steps, paths of product eco-innovation and new creative management approaches. Ecodesign is a systematic methodology that incorporates environmental considerations into the design process of products. Its main purpose is to develop environmentally friendly goods and services. This is achieved by reducing products’ environmental burdens throughout the whole life cycle and taking into account the other product and customer requirements such as functionality, quality, safety, cost, manufacturability, ergonomics and aesthetics. Ecodesign is not an assessment method or a model, but a procedural framework which includes iterative steps of assessment and design and requires the use of analytical tools as checklists, LCA, guidelines, databases, etc. and design tools/procedures. ISO/TR 14062 supplies a method to implement an ecodesign process at enterprises. However, the variability of situations, in terms of type of product, business strategy, design and development procedures used by the enterprises, and of tools developed is so large that cannot be analysed within the scope of this analysis. The SWOT analysis here described has been performed in terms of integration of the New LCA, with broadened and deepened scope if compared to ISO-LCA, in the Ecodesign procedural framework in order to obtain a Design for Sustainability3. Such integration must not be necessarily intended as integration of analytical tools for the New LCA with the existing design tools, but more in general as integration of procedures and paths. Under this perspective, Strengths will be the intrinsic strong points of this integration (value for sustainability); Weaknesses will be points were further research is required in order to overcome limitations and shortcomings; Opportunities will be the external drivers for this integration; Threats will be barriers to the integration due to external conditions. Stage 1. Product improvement —Improvement of products that are already on the market with regards to pollution prevention and environmental care. Stage 2. Product redesign or eco-redesign — The product concept stays the same, theenvironmental quality is optimised redesigning the product or parts of it. Stage 4. Systems innovation — It involves new products and services development, which requires changes in the related infrastructure and organisations. 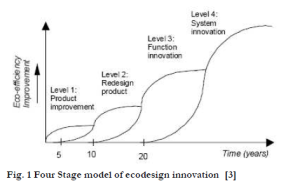 As shown in Fig.1 this path towards higher levels of improvement requires increasing amount of time, but includes moving towards more and more complex sustainable design innovations. An Ecodesign process requires the assessment of the potential environmental impacts of a product throughout its life cycle and the identification of new criteria of design for generating improvement options. In general the product’s design process can be broken down in three typical steps: product strategy (or planning), product formulation (or conceptual design) and product specification (or detailed design) [4, 5]. Different tools are required depending on the step of the process. The product strategy is not linked to a specific product and tools are required that help developing general improvement ideas and provide a preliminary assessment of the different options. For this scope MET (Materials Energy and Toxicity), ERPA (Environmentally responsible product assessment) matrixes, environmental benchmarking are, for example, suitable tools of analysis; brainstorming, environmental design strategies and principle, SWOT analysis can be used to generate improvement options. Also methods like the QFD (Quality Function Deployment) for Environment , which has been developed by adapting QFD to handle the environmental and traditional product quality requirements together, are suitable for the early stage of the design process. The product formulation can take advantage of the following tools: check list criteria combined with scoring systems (e.g. Pareto chart or ABC-Analysis); material databases; screening LCA. The checklist criteria can vary between business areas and product categories, so for an operational ecodesign it would be important to develop specific guidelines and checklist per product typology. For product specification it is important to obtain reliable environmental information as a basis of decision; therefore tools as detailed LCA and LCI databases are suitable to optimize parts and components and to deal with environmental trade-offs. Further details on types of tools for the different steps of the design process are given by the ISO/TR 14062. The integration of the environmental aspects into the product development process in a systemic approach, as the Ecodesign process allows, can have important consequences from business points of view. In fact it stimulates partnerships with suppliers/distributors/recyclers and plays a key role in product innovation, opening then new market areas. Existing experiences at companies show that an ecodesign project can lead to improve the environmental performance of a product and also to produce businesses financial benefits, offering enterprises a win-win situation. There is however the necessity of giving more evidence to these activities, which are often in the form of prototype projects or in niche market, and of demonstrating that these experiences can be successfully applied in regular industrial activities . Several studies have been published, which have tried to identify barriers to a wider and effective diffusion of Ecodesign, [8-10] just to mention some of them. To the importance of traditional issues, such as formal organisation, tools development, management commitment, economic actors of the product chain, customer’s perceptions, another aspect of concern has been added, the so-called ‘soft side’ of Ecodesign , which include socio-psychological factors such as lack of communicative skills and degree of perception of the environmental problems. Main advantages of a classical ecodesign process are the following: it allows preventing environmental damages in the design phase of a product rather than intervening to reduce them after production; it is flexible with respect to different situations that require interventions of product/system modification; it offers a variety of methods and techniques to integrate a wide range of design requirements (performance, costs, environmental impact) in product development from conception to disposal. In the framework of an ecodesign process the potential of a life cycle analysis to enhance the environmental performance of a product is maximised. At the same time, the integrated analysis of different criteria (functionality, quality, safety, cost etc.) allows reducing costs throughout product’s life cycle phases, improving technical characteristics of the product and increasing competitiveness. However, a weak point of ecodesign, as it is presently, is that it can be applied to the product’s development without taking into account meso and macro-Economics, social, cultural and political relations established outside the enterprises’ horizon. As a consequence the risk occurs that the process of product’s development leads to select options internally optimised but unsuitable if evaluated from a wider point of view. The integration of a New LCA approach in the Ecodesign procedural framework can help overcoming this problem as it supplies not only information on the environmental performance of the product system but also insights on economic and social mechanisms. The types of intervention are twofold: supplying a predefined framework for the design process; entering directly in the enterprise’s design process. In this second case, as a first step a qualitative assessment of the most relevant mechanisms and relations, besides the technological relations and environmental mechanisms (presently taken into account in LCA), would increase the knowledge about the product and its potential interactions with the economy, the society and the environment in the short, mid and long term and would allow for early selection of the most sustainable solutions. As far as the design process proceeds, quantified and more complete assessments would follow in order to arrive at the detailed design of the product system. Since in the Eco-design process the integration of the design requirements calls for a strong collaboration between different enterprise’s departments (marketing, purchasing, quality, environment, design, production), all the actors of the management process are involved early in the design process. This approach makes it easier the introduction of other aspects of sustainability, going towards a Design for Sustainability, and facilitates the implementation of the selected options due to increased awareness at the different levels of the organization. In a process of Design for Sustainability the possibility of elaborating new ideas and to critically rethinking some aspects of the overall business strategy is more then ever enhanced, being the basis for innovation paths that help companies conquer new markets or acquire competitive advantages. The potential for innovating become very large, especially in the case of shift from a product to a product-service system. Moreover since the application of this design process promotes collaboration and integration along the supply chain, the process of innovation and development of sustainable products could extend to other companies and have a greater impact on the production sector and the entire society. With the use of a New LCA further aspects would be integrated in the design process and the procedural framework could become more and more complex. The question about the level of expected interaction between the product and the overall economy is particularly critical. If this interaction is at such a level that the studied life cycle does not cause significant changes of other life cycles, the introduction of market mechanisms (and potentially of most of the social ones) in the assessment could be neglected; otherwise this introduction will be necessary with consequent increase of the assessment complexity. The degree of complexity affects also the choice of tools. In classical ecodesign process special know-how and tools are required, which present different levels of complexity, depending on the design step where they are applied. Large companies can develop them in-house, whereas SMEs need to obtain them from outside. However most of the tools already developed are not easy to implement in SME because they require significant investments of resources (material, human, and technological). This should be taken into account also while thinking about tools for a New LCA, to avoid excluding most of the companies from the participation in the innovation path promoted by a process of Design for Sustainability. The introduction of all different aspects of the sustainability will require the reconsideration of the general method of the ISO/TR 14062 to include additional requirements and, on the other side, a certain amount of work will be needed to develop and update sector specialised guidelines, checklists and databases suitable to be used under this new framework. In fact, a major shortcoming of the integration of the New LCA into ecodesign is data requirement. At developing stage, it may happen that not all the required data is available and estimation is needed, which can lead to big uncertainties in the New LCA results. This is also true presently for the integration of LCA into ecodesign, but the problem could increase as the New LCA, with a broadened and deepened scope, requires more data. Some data (especially economic and social data) can be estimated with sufficient accuracy only at an advanced stage of product development. 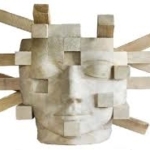 From the methodological point of view the New LCA should guarantee robustness enough to avoid that uncertainty of input data dramatically affects reliability of the results. As regards the practicability of the New LCA in ecodesign, a contribution can be given by the development of a set of scenarios providing background system data, as energy, transport and waste treatment data, common for a large number of products. Another possibility is the sectoral approach, where a detailed New LCA study allows a good knowledge of the major and more relevant sustainability questions to be assessed. This knowledge is the basis for developing tools to support enterprises, such as guidelines on most relevant impacts to be assessed, generic data, scenarios, information on the most relevant geographical scale for the assessment, time frame, etc. As for classical ecodesign, but with an increased complexity due to the enlarged scope of the assessment, the definition of a common format for data exchange between assessment and design tools would be a key step to enlarge the practicability of both ISO-LCA and New LCA in a design process. Regulation at European level (proposals, directives,…) and at National level (bills, decrees, laws,…) creates opportunities for the ecodesign methodology in terms of gained visibility, wider diffusion at enterprises and further development of specific tools. For example, legislation oriented at extending the manufacturer’s responsibility beyond the commercialization of products, such as the Directive 2002/96/EC on Waste Electrical and Electronic Equipment, pushes the adoption of ecodesign strategies for recovery and recycling. The scope could be enlarged to include other aspects of sustainability, besides environmental concerns, as proposed by the Directive 2005/32/EC for energy-using products EuP. In fact, even if mainly aimed at setting ecodesign requirements to achieve a high level of protection for the environment, its contribution to sustainable development, which also requires consideration of the health, social and economic impact, is highlighted. As stated in the Directive, “improving the energy efficiency of products contributes to the security of the energy supply, which is a precondition of sound economic activity and therefore of sustainable development”. Sustainable Consumption and Production policy could adopt a similar approach also for not Energy Using Products . Green Public Procurement policies and promotion of certification of the environmental quality of products are example of tools exerting a positive effect on the market demand for green products. A similar approach could be implemented as a driving force for the adoption of Design for Sustainability. Needs for specialised know-how and tools to implement a design for sustainability could be a threat for the integration of the New LCA in the design process, especially if the SMEs situation is considered. In fact additional investments of material, human and technological resources are necessary, at least in the first phase of implementation of the new approach. This aspect can become an insurmountable barrier, especially under economic recession conditions, and could stop the entire process of integration. Moreover to be effective this new approach, as classical ecodesign indeed, needs strong commitment and support by the management and cooperation between departments: lack of commitment and cooperation hinders the process, but at the same time they are not easy to be created and the answers cannot be found in the methodology itself (see “soft side” concept in ). A scarce interest towards the integration of the New LCA could also be observed if little attention were given to the development of marketing tools aimed at favouring companies adopting this approach or if the acceptance from the market were small. ECO2-IRN (Ecologically and Economically Sound Design and Manufacture— Interdisciplinary Research Network). Defining ecodesign, workshop: economically and ecologically sound design and manufacture. Third Forum, Manchester Metropolitan University, UK; 1995. K. Masui, “Environmentally Conscious Design Support Tool in Early Stage of Product Development -Quality Function Deployment (QFD) for Environment: QFDE”, ECP Newsletter No.20, 2002. C. Boks, The soft side of ecodesign, Journal of Cleaner Production, 14, 1346–1356, 2006. A. Tukker, P. Eder, M. Charter, E. Haag, A. Velcasteren, T. Wiedmann, Eco-design: the state of implementation in Europe, The Journal of Sustainable Product Design, 1, 147- 161, 2001. H. Baumann, F. Boons, A. Bragd, Mapping the green product development field: engineering, policy and business perspectives, Journal of Cleaner Production, 10, 409–425, 2002. C. van Hemel, J. Cramer, “Barriers and stimuli for ecodesign in SMEs”, Journal of Cleaner Production, 10, 439–453, 2002. M. Charter and A. Chick, Towards sustainable product design. In: Proceedings of Towards Sustainable Design Conference (1995 July). H. Brezet, C. van Hemel, ECODESIGN– A Promising approach to Sustainable production and consumption, UNEP, Paris Cedex, 1997.